Definition at line 62 of file llfloaterpreference.h. Definition at line 113 of file llfloaterpreference.cpp. References LLTabContainerCommon::addTabPanel(), llLCD::Enabled(), FALSE, LLPanel::getLabel(), LLPrefsIM::getPanel(), LLPrefsChat::getPanel(), LLControlGroup::getS32(), gSavedSettings, mAudioPanel, mDBPanel, mDisplayPanel, mDisplayPanel2, mDisplayPanel3, mGeneralPanel, mInputPanel, mLCDPanel, mMsgPanel, mNetworkPanel, mPrefsChat, mPrefsIM, mPrefsVoice, mTabContainer, mWebPanel, NULL, onTabChanged(), LLTabContainerCommon::selectTab(), and LLPanel::setDefaultBtn(). Definition at line 195 of file llfloaterpreference.cpp. References mAudioPanel, mDisplayPanel, mDisplayPanel2, mDisplayPanel3, mGeneralPanel, mInputPanel, mMsgPanel, mNetworkPanel, mPrefsChat, mPrefsIM, mWebPanel, and NULL. Definition at line 257 of file llfloaterpreference.cpp. 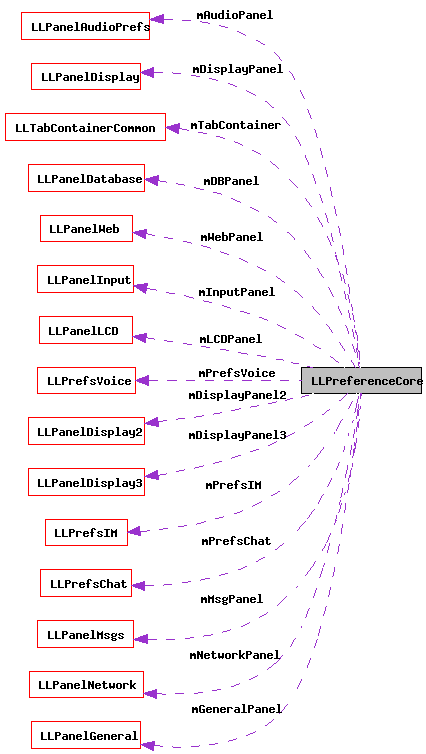 References LLPanelLCD::apply(), LLPanelDatabase::apply(), LLPanelMsgs::apply(), LLPrefsIM::apply(), LLPrefsVoice::apply(), LLPrefsChat::apply(), LLPanelDisplay3::apply(), LLPanelDisplay2::apply(), LLPanelDisplay::apply(), LLPanelNetwork::apply(), LLPanelInput::apply(), LLPanelGeneral::apply(), llLCD::Enabled(), mDBPanel, mDisplayPanel, mDisplayPanel2, mDisplayPanel3, mGeneralPanel, mInputPanel, mLCDPanel, mMsgPanel, mNetworkPanel, mPrefsChat, mPrefsIM, and mPrefsVoice. Definition at line 281 of file llfloaterpreference.cpp. References LLPanelLCD::cancel(), LLPanelDatabase::cancel(), LLPanelMsgs::cancel(), LLPrefsIM::cancel(), LLPrefsVoice::cancel(), LLPrefsChat::cancel(), LLPanelAudioPrefs::cancel(), LLPanelDisplay3::cancel(), LLPanelDisplay2::cancel(), LLPanelDisplay::cancel(), LLPanelNetwork::cancel(), LLPanelInput::cancel(), LLPanelGeneral::cancel(), llLCD::Enabled(), mAudioPanel, mDBPanel, mDisplayPanel, mDisplayPanel2, mDisplayPanel3, mGeneralPanel, mInputPanel, mLCDPanel, mMsgPanel, mNetworkPanel, mPrefsChat, mPrefsIM, and mPrefsVoice. Definition at line 72 of file llfloaterpreference.h. Definition at line 306 of file llfloaterpreference.cpp. Definition at line 314 of file llfloaterpreference.cpp. Definition at line 89 of file llfloaterpreference.h. Referenced by cancel(), LLPreferenceCore(), and ~LLPreferenceCore(). Definition at line 97 of file llfloaterpreference.h. Referenced by apply(), cancel(), and LLPreferenceCore(). Definition at line 86 of file llfloaterpreference.h. Referenced by apply(), cancel(), LLPreferenceCore(), and ~LLPreferenceCore(). Definition at line 87 of file llfloaterpreference.h. Definition at line 88 of file llfloaterpreference.h. Definition at line 83 of file llfloaterpreference.h. Definition at line 84 of file llfloaterpreference.h. Definition at line 96 of file llfloaterpreference.h. Definition at line 95 of file llfloaterpreference.h. Definition at line 85 of file llfloaterpreference.h. Definition at line 91 of file llfloaterpreference.h. Definition at line 93 of file llfloaterpreference.h. Referenced by apply(), cancel(), LLPreferenceCore(), setPersonalInfo(), and ~LLPreferenceCore(). Definition at line 92 of file llfloaterpreference.h. Definition at line 82 of file llfloaterpreference.h. Referenced by getTabContainer(), and LLPreferenceCore(). Definition at line 94 of file llfloaterpreference.h. Referenced by LLPreferenceCore(), and ~LLPreferenceCore().